We have wild turkeys roaming our woods and occasionally as we hike, I find a feather or two. I have been saving them for years, collecting them in feather bouquets. 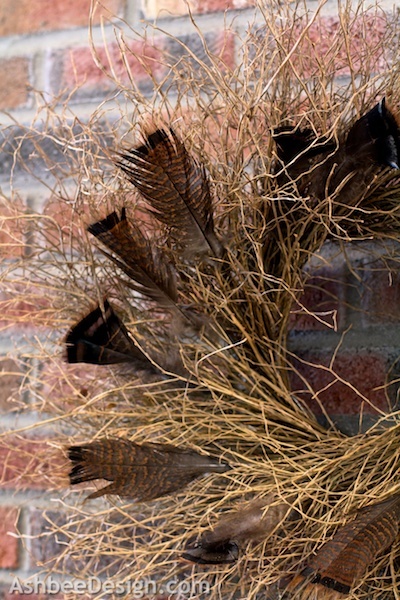 This morning I took the smaller turkey feathers and quickly inserted them into the twig wreath hanging on the family room hearth. 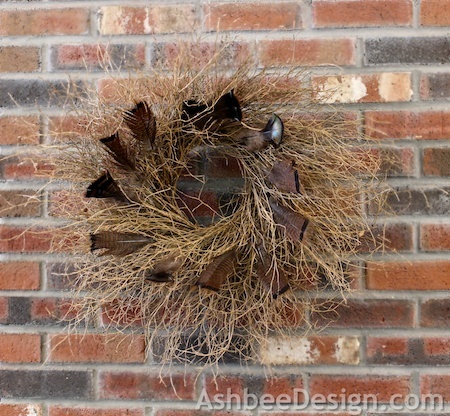 It added some wonderful fall accents to the very plain yet natural wreath. I know everyone in the blog world is all about painting brick white (along with every piece of wood tim and cabinetry). I just can't see it in my home which is filled with natural elements. I'll keep the natural brick. A little history about this hearth. I built it myself long before there was an Internet to learn how. This room was David's original workshop and there was a cinder block chimney there. I went to the local school which was having an addition built and I watched the masons laying brick. I asked a few questions and I came home a taught myself some basic masonry. This is my only brick project and it works well in our home. The wood stove is our heat source. I probably could dig up a picture of me over 20 years ago slinging the mud for this project. Maybe not! On the far wall you can see one of the sculptures designed by my husband David. I have explained his work before but for those of you that are new viewers, here is a link to his website ( my other job!). Take a peek to see his kinetic sculptures in action. I really like your wreath, it's just enough, not overdone. Nice job! Thanks Diane - and quick, too! Easy to switch out at the end of the season. What a talented lady you are, the hearth and wreath look terrific. Hi Merry, Jack-of-all trades I am! Thanks. 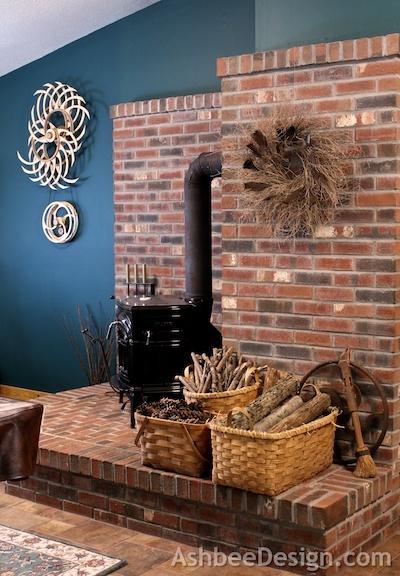 Great wreath, and I love your fireplace and stove. I agree leave it natural! This is a great wreath! Love the feathers. Leave it unpainted, it looks great the way it is. Wow - I LOVE this wreath!! Great job. Thanks for linking up at Take it on Tuesday! Pinning this.